November 21, 2017 By Denny Hansen & filed under All Articles, Rifles & Carbines, Weapons. 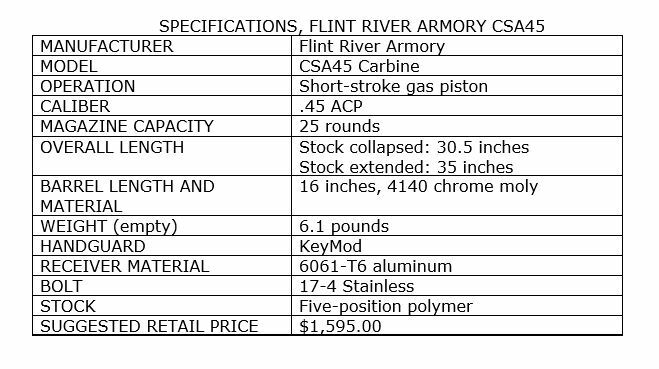 Right side of Flint River Armory CSA45 Carbine as evaluated. The first and most common definition is a shorter version of the regular rifle, but still firing the standard service cartridge. A modern example of this is the M16A4 rifle and the M4A1 carbine, both chambered in 5.56x45mm NATO. The second generally accepted but less common definition is a shorter version of a rifle, but firing a pistol cartridge. An example is the Heckler & Koch HK41 chambered in 7.62mm NATO (.308 Winchester) and the HK94 chambered in 9mm Luger. The second definition brings us to the subject of this article—the Flint River Armory (FRA) CSA45 Carbine. Flint River Armory CSA45 Carbine came in fitted Pelican case with cutouts in the firm foam interior that perfectly matched the carbine, and extra cutouts to accommodate optics, lights, and spare magazines. 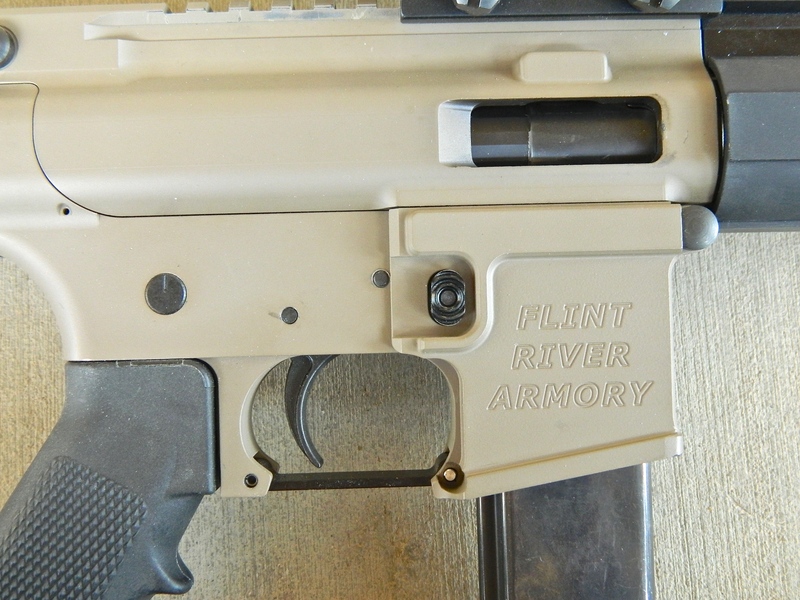 The Flint River CSA45 Carbine is based on the AR-15 family of weapons. When the carbine arrived, I was surprised that rather than the simple cardboard box many manufacturers use, the CSA45 came in a very nice Pelican case with cutouts in the firm foam interior that perfectly matched the carbine, and extra cutouts to accommodate optics, lights, and spare magazines. A nice touch, but it undoubtedly adds to the price of the firearm. As the name indicates, the carbine is chambered in .45 ACP. It employs a short-stroke gas-piston operating system with rotating locking bolt. Starting with the upper receiver, the CSA45 does not have the useless appendage known as the forward assist. There is also no shell deflector or dust cover. I personally like the slick-sided appearance. Left side of lower receiver showing side charging handle, lack of bolt release, and different position of rear takedown pin. Screw just forward of charging handle slot is the ejector. There is also no standard charging handle, but rather a reciprocating side charging handle. A shooter can maintain a full firing grip on the pistol grip with his strong hand while operating the charging handle with his weak hand. The bolt stays to the rear when the last shot is fired, but the CSA45 does not have a standard bolt release. With a loaded magazine inserted, pulling back on the bolt handle and then releasing it chambers a fresh round. Although perfect for a right-handed shooter, southpaws will have a little trouble manipulating the handle by either going over or under the upper receiver. Trying this on the range, I found it easier and more positive to go underneath. Your mileage may vary. The CSA45 has a one-piece bolt carrier. The bolt group is similar to that of an AR-15 but has several differences. Rather than the inertia firing pin found in the AR, the CSA45 firing pin is spring loaded. The bolt has an extractor but no ejector. Ejection is accomplished by a pin that protrudes into the upper from the left side. 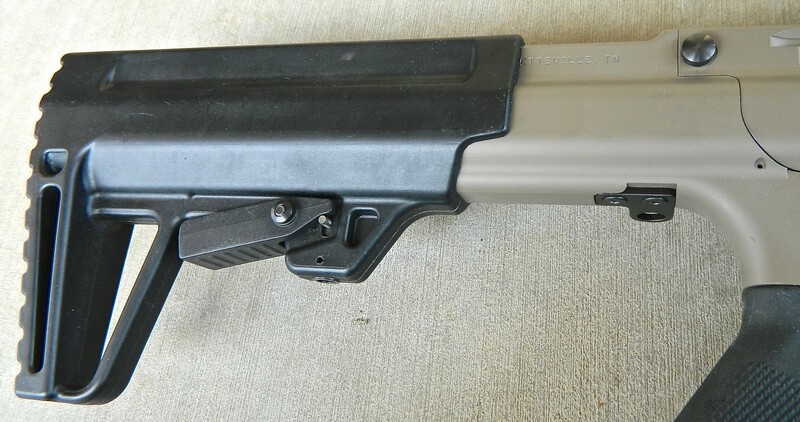 A Picatinny rail runs the length of the upper receiver. Right side reveals no forward assist, brass deflector, or dust cover. The free-floating handguard on the carbine I received for testing was of the KeyMod type (M-LOK handguards are also available) and ran to about four inches from the end of the muzzle. A Picatinny rail on top of the handguard complements the KeyMod attachment points. The carbine came with a single three-inch, four-slot KeyMod-to-Picatinny-rail adapter segment for attaching a light or other accessory. 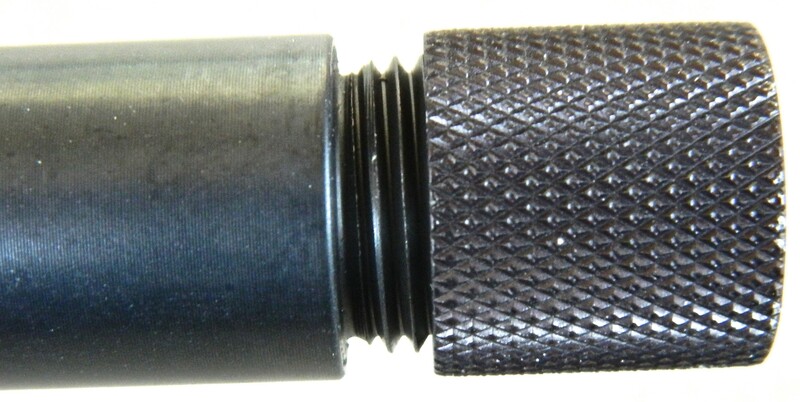 Barrel is threaded for suppressor or other muzzle device. Thread protector is included. The muzzle of the 16-inch 4140 chrome moly barrel is threaded for a suppressor or other muzzle device. A thread protector cap is included. Moving down to the lower, the CSA45 uses standard AR-15 internals, including the trigger group, safety and magazine release. The carbine uses an AR-15 pistol grip and comes with an A2-type grip. If you like to “customize” your carbines, this is the only part you can change. Lower receiver extension (buffer tube) is integral with the lower receiver. Rectangular in shape, it only accepts proprietary Flint River five-position collapsible stock. The CSA45 does not use a standard lower receiver extension (buffer tube), but rather this part is machined onto and integral with the lower receiver. Rectangular in shape, it only accepts the proprietary Flint River five-position collapsible stock. 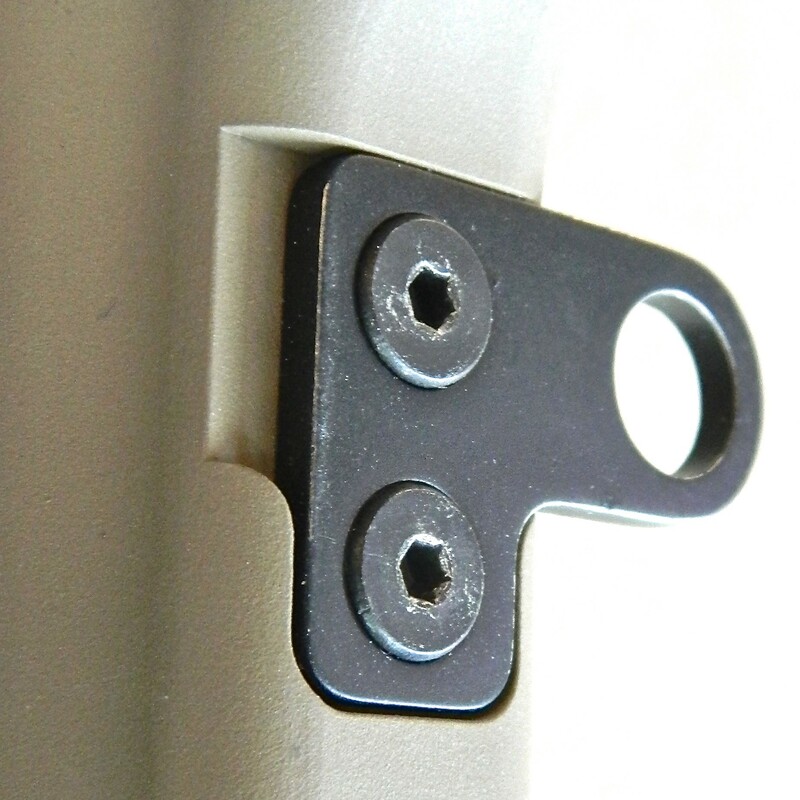 Since the buffer retainer and spring cannot be captured in the normal fashion by the threaded end of the lower receiver extension, it is held in place with a small pin. 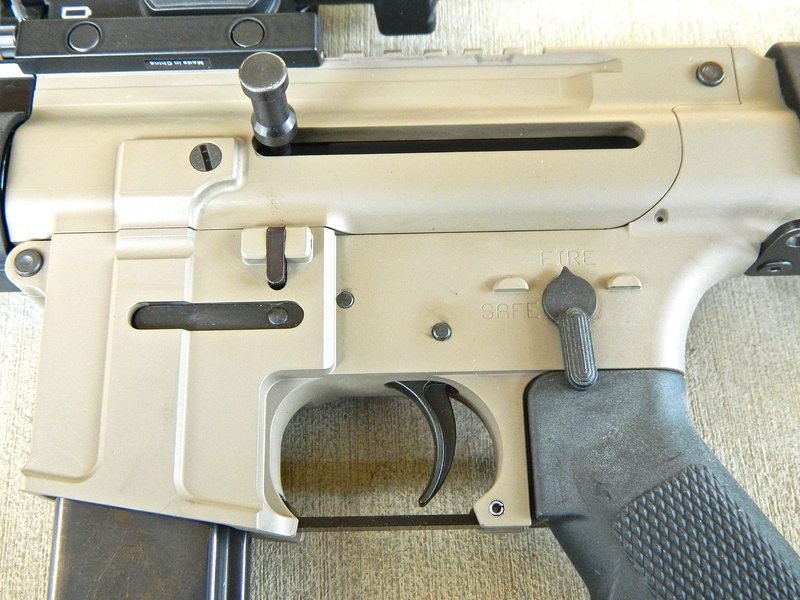 A sling attachment is screwed to the bottom of the lower receiver and protrudes to the left side. The sling attachment appears to be reversible, though I was not able to confirm this, as the screws apparently had a strong thread locker on them, and I did not want to take the chance of stripping the screw heads. Unlike an AR-15, the rear takedown pin is not located on the lower receiver just above the safety, but is at the top rear of the upper. 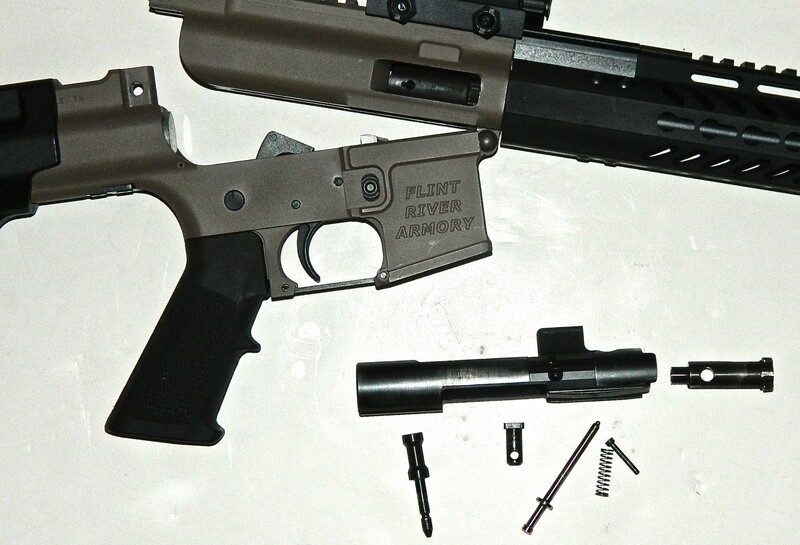 Disassembly is achieved by pushing out the upper takedown pin, retracting the bolt, and pulling the charging handle from the bolt carrier. 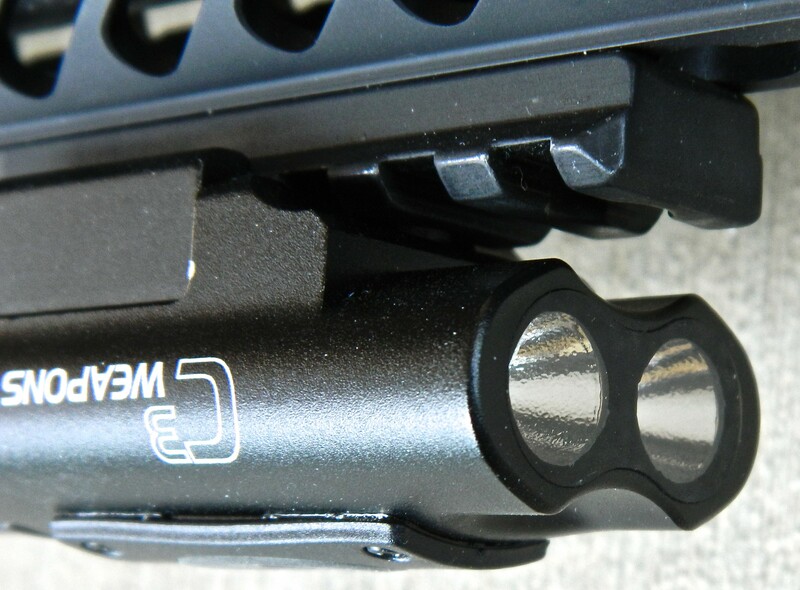 The charging handle is held in place by a spring-loaded ball detent. The spring is very stout, and I seriously doubt if the charging handle could be accidentally dislodged. Overall length is 30.5 inches with stock collapsed, and 35 inches extended. Weight unloaded is 6.1 pounds. Inserting a 25-round mag with 230-grain .45 ACP adds about 1.5 pounds. The FRA CSA45 comes with two 25-round magazines. The carbine is also available in pistol and SBR versions. No manual or lock came with the sample gun. Based on readings from my Lyman Electronic trigger pull gauge, trigger pull averaged 6.5 pounds. I was provided two products from LUCID Optics to evaluate with the CSA45: A LUCID Gen III HD7 red dot optic, and the LUCID C3 Weapons Light. Hansen believes LUCID Optics Gen III HD7 utilized in evaluation is a lot of optic for the money. 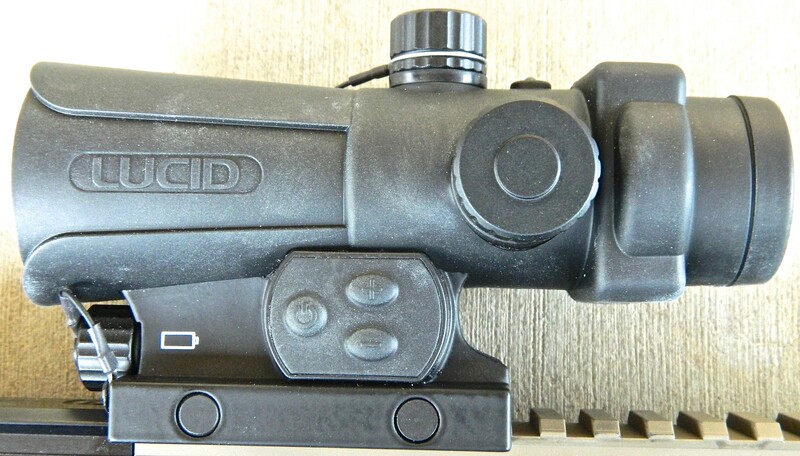 The LUCID Gen III HD7 is a quality red dot sight (RDS) that rivals much more expensive models. It is machined from a single piece of aluminum with a rubber armor finish. I attached the HD7 with my Fat Wrench, torqueing the mount screws to the rail at the suggested 40 inch pounds. Features of the HD7 include the ability to change to four reticle patterns to fit one’s personal preference. The patterns are a dot, circle dot, T-hash mark, and chevron. The latest generation of the HD7 RDS has ten brightness levels. The buttons are more durable than and the light sensor nearly twice as sensitive as previous versions—useful for going from bright daylight into a dim or dark area—and can be used in auto or manual modes. To go from manual mode to auto, hold the power button for three seconds. Repeat to return it to manual. If no changes have been made in two hours, the HD7 has an auto-shut-off feature to conserve batteries. At a suggested retail of $259, it’s a bargain. LUCID C3 Weapons Light produces 300 lumens of bright white light and has a runtime of just over three hours. The C3 Weapons Light from LUCID Optics has a 6061-aluminum housing, making it waterproof and shockproof up to .458 SOCOM. The C3 is 2.75 inches long, is just over an inch wide, and weighs only 2.2 ounces, so you hardly notice it mounted on the rail of a rifle. Running on three AAA batteries, the C3 produces 300 lumens of bright white light with a runtime of just over three hours. A pressure switch on the bottom of the light either turns the light on or off—there is no momentary. To activate the strobe function, press the switch and hold it for three seconds. When the light is turned off, it defaults to constant on when turned back on. Suggested retail price is $129.00. 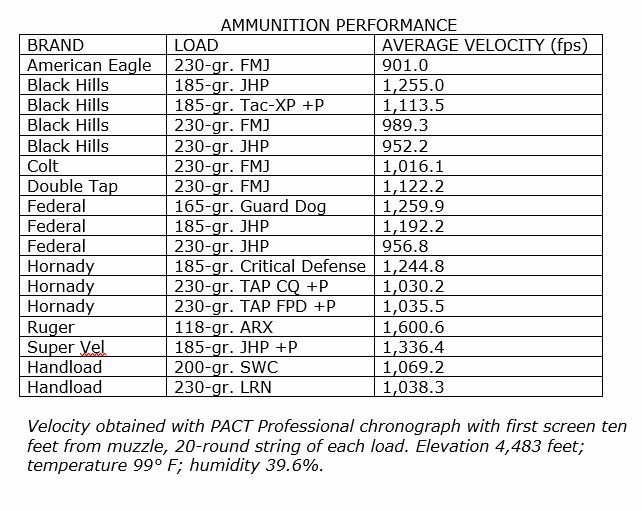 My normal evaluation protocol involves firing a 20-round string of each load over the screens of my PACT Professional Chronograph to establish the average velocity. For this evaluation, I used 15 loads from eight manufacturers, with bullet weights ranging from 118 to 230 grains and including several +P offerings, and two handloads. I was especially interested to see how these rounds would perform out of the 16-inch carbine barrel as compared to the usual 4¾- to five-inch pistol barrels. Sling attachment point on lower receiver appears to be reversible, but Hansen could not confirm this because screws apparently had a strong thread locker on them, and he did not want to risk stripping them. As expected, all rounds easily obtained velocities higher than when fired from a pistol. 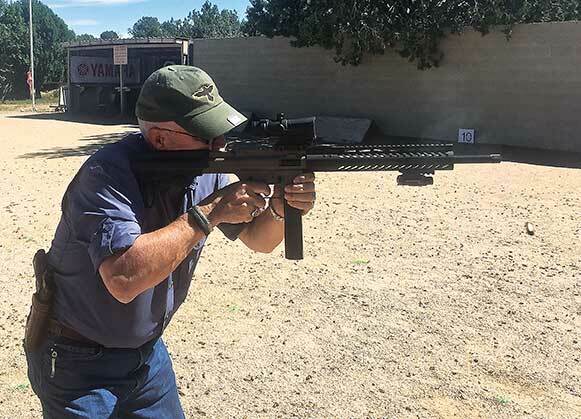 The top performer in this regard was the 118-grain Ruger ARX, with a 20-round average of 1,600.6 feet-per-second (fps)—about 300 fps faster than a pistol. Extraction and ejection were very reliable, with empty cases ejected at 1:00 up to 15 feet. As is normal with a pistol cartridge in a carbine, recoil with all loads was extremely mild. Rather than a formal accuracy test—shooting groups with each load, measuring them and then averaging for group size—I contented myself by ascertaining each load would group into a four-inch circle (roughly head-shot capable) at 50 yards. Fieldstripping CSA45 is very similar, though not identical, to an AR-15. Next I ran several practical drills moving laterally and backward, the goal being to get off the line of attack and create distance while simultaneously engaging, shooting two to five rounds each time to break the bad range habit of always shooting only two rounds. I also ran several failure-to-stop drills and shooting on the move from around 15 yards to contact, firing a non-standard response (more than two but generally less than five rounds). Setting up a bank of three targets at varying distances of five to seven yards, I engaged them in what some call “tactical order,” also known as Roadhouse Rules. In short, when dealing with multiple targets, this means everyone gets firsts before they receive seconds. Working from left to right, single round on target one, single round on target two, two rounds on target three, then back to target two with a single round, and finally back to target one with a single round (1, 1, 2, 1, 1). Lastly, I conducted several full magazine dumps at 15 yards to gauge how the firearm performs when it gets very hot, followed by five rounds into the 3×5-inch head-shot area of the target to see if accuracy had deteriorated. It had not. A total of about 550 rounds were consumed in the evaluation of the CSA45. Only two malfunctions occurred during my test: one with Black Hills 185-grain Tac-XP +P and one with Super Vel 185-grain JHP +P. 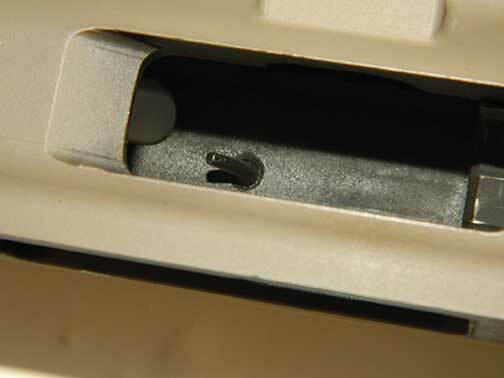 In both incidents, the tip of the round impacted the edge of the chamber, pushing the bullet into the case and not allowing the round to chamber. This was a failure rate of only about .40 percent. While both of the above loads have similar nose profiles, so did others in the evaluation, so this is an anomaly I can’t explain. Since a manual was not included and I found no mention of ammo restrictions on FRA’s website, I assumed +P ammo was acceptable. But when disassembling the carbine for photos after the evaluation, I observed that the pin that serves as the ejector had bent backwards. I don’t know if this was due to the +P ammo or possibly an improperly heat-treated part. Extractor bent backward during evaluation but still functioned. After receiving and evaluating the carbine, I had a few questions for FRA. I never did get a live body on the line and, though I left several voice mails and emails, no reply was received by the time this went to press. I honestly hope this is not indicative of the customer service Flint River Armory offers, but I would be remiss in my duty not to mention it. Gunsite Chief Operating Officer Ken Campbell fires CSA45 on Gunsite’s South Range. Empty cases ejected at 1:00 up to 15 feet. Although normally thought of as a potent self-defense cartridge, the .45 ACP is very accurate and still used in many matches for that reason. Coupled with an accurate, easy-to-shoot carbine, it excels in both accuracy and power. The Flint River Armory CSA45 performed very well. Ammunition for pistols is generally less expensive than rifle ammo but serves well for self-defense purposes, especially when fired from the longer-barreled carbine. My only hesitation in giving the carbine a full recommendation at this time, although a sample of one, is the aforementioned bent ejector.